KROQ have revealed that Blink-182 will perform their 2003 self-titled album in its entirety (as well as other classic Blink tracks) at the Hollywood Palladium in Los Angeles, CA on November 6th and 7th. Tickets for the self-titled album shows go on sale Friday, October 25th at 10am via Ticketmaster. You can check out an excerpt from the KROQ article confirming the news, which includes details on how you could win tickets to the shows as well as a private concert at Red Bull Sound Space, below. 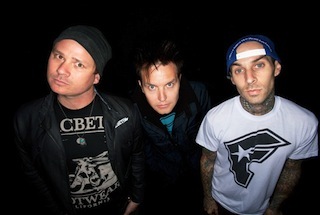 KROQ presents Blink-182 at the Hollywood Palladium on November 6th and 7th! The band is celebrating the 10th Anniversary of their iconic self-titled release and will be performing the album in its entirety, as well as other classic Blink songs. But that’s not all… the band will also be performing live in the Red Bull Sound Space at KROQ on November 7th at 1pm! Tickets for the Palladium shows go on sale Friday, October 25th at 10am via Ticketmaster.com. Tickets for the Red Bull Sound Space show can’t be purchased, but you can listen to win all week long or click the link at the bottom of this page for an additional entry!